How long does it take to become Canadian? Not simply to obtain citizenship, but for an immigrant to be at home here in Canada. The main conclusion of a just-released report is that even after living in Canada for decades, if you lose your job you are worse off than when you arrived here. At Progressive Moulded Products (PMP), the largest auto-parts manufacturer in the Greater Toronto Area, 97% percent of the workers were immigrants, 87% ESL speakers. In June 2008 PMP filed for bankruptcy protection and without warning closed their operations. Though the workers resisted the closure with a blockade, the company obtained a legal injunction to remove them, and they were left with nothing. Ryerson University released a study of these workers in July 2013. 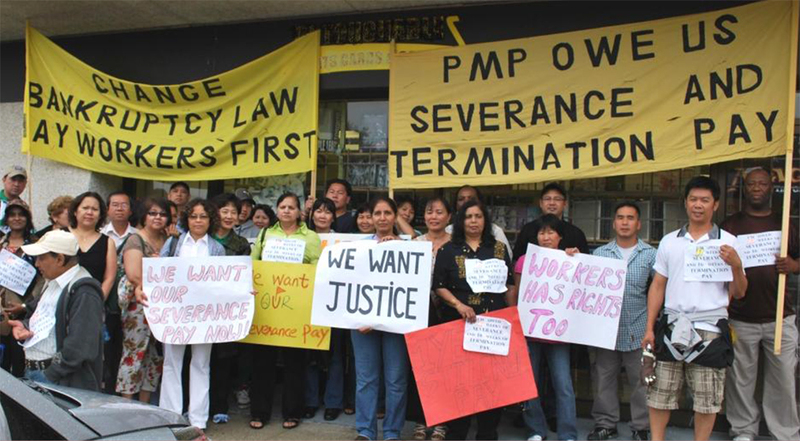 “We were interested in finding out how this group of workers has managed since the plant closure five years ago and whether they have found stable work again,” said Winnie Ng, CAW-Sam Gindin Chair in Social Justice and Democracy and lead author of the study documenting the experiences of 78 of the 2,400 workers who lost their jobs. For many immigrant workers, their immigrant status never disappears. Settlement and integration are typically a continuum. People use settlement services when they first arrive (e.g. referrals for housing, healthcare, schools, employment, language training, re-certification). Integration refers to the long-term, two-way process in which immigrants and refugees become full and equal participants in the social, political, cultural and economic life of the community. However, their struggles to find appropriate training and stable re-employment in the years after the closure suggest that, for many immigrant workers, their immigrant status never disappeared. After more than half a lifetime of working in Canada, they found themselves faring worse than when they first arrived. In addition to the challenges that all older workers face in making a second career transition, these workers are struggling with being ‘immigrants all over again’, without access to even the limited settlement programs available to new immigrants since they no longer fit that category. Tags: Canadian immigrants, citizenship, immigrants, Progressive Moulded Products, settlement programs, Winnie Ng. Bookmark the permalink. Previous post ← WHAT DO THEY CALL YOU AT HOME?